Today’s garden reminded me of those ‘Last Chance!’ rails in high street clothes shops. It’s the end of another season, stock is diminished, and there are only a few oddments left from which to take one’s pick. 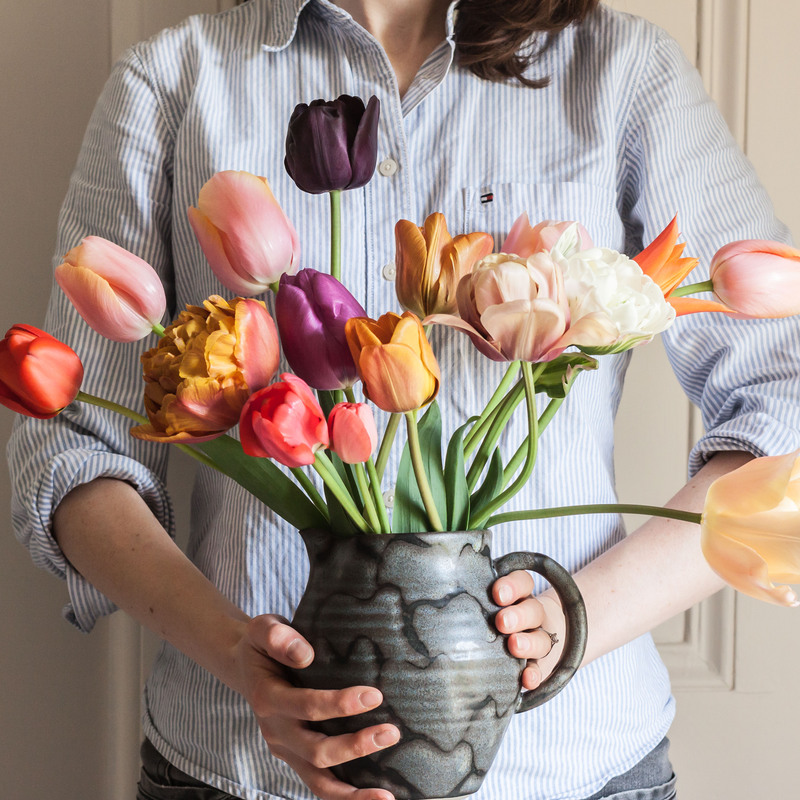 Luckily the colours of today’s flowers aren’t as strange and eclectic as the remnants of a Topshop fashion season are wont to be. The bold pink spike of Heuchera ‘Silver Scrolls’ is set off beautifully by a precious delphinium (Cathy at Rambling in the Garden, who hosts our Monday vases, must have a strange hold over me that I sacrificed one of these), a pale apricot foxglove and a single confectionary-pink snapdragon, along with those inexorable sweet peas and some Cosmos ‘Purity’, both of which featured extensively in a vase two weeks ago. I have also been dying to include some poppy seed heads in a vase, and now I have been able to. 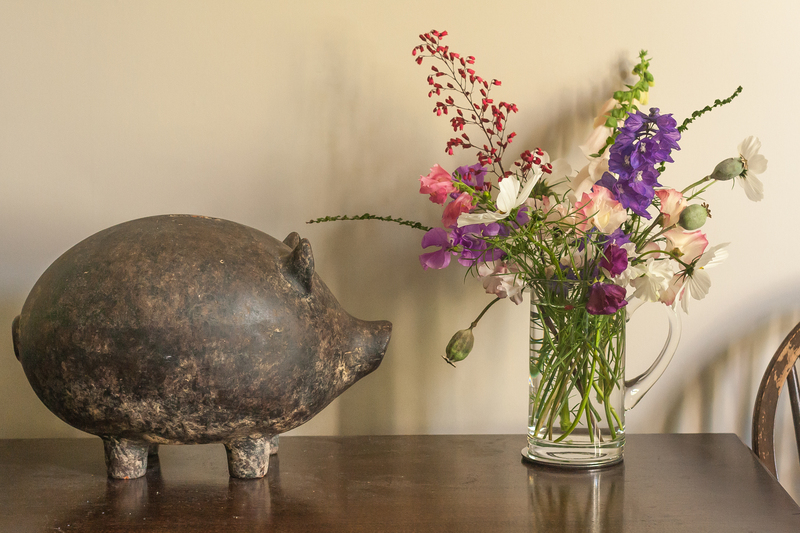 Pigs have also been in fashion recently, I gather, and since Mr Pig was standing nearby on this cooler side of the room, having been moved from his usual home on the hearth due to getting dangerously hot beside our open fire, I allowed him to model beside today’s flowers. Yes, autumn means glowing coals chez nous, with the Brazilian and I fighting over who gets to stoke the blaze, and the flowers on the mantelpiece starting to wilt in the smoky warmth of the room. Just as an afterword, a couple of weeks ago the Brazilian and I were wandering lazily through the streets of Sciennes when we came across a young fellow enthusiastically beheading the beautiful mops off a purply pink hydrangea in someone’s front garden, and launching them casually in to a wheelie bin. ‘You’re throwing away those beautiful flowers,’ I blurted out. He agreed that indeed he was, and said I could take as many as I want. 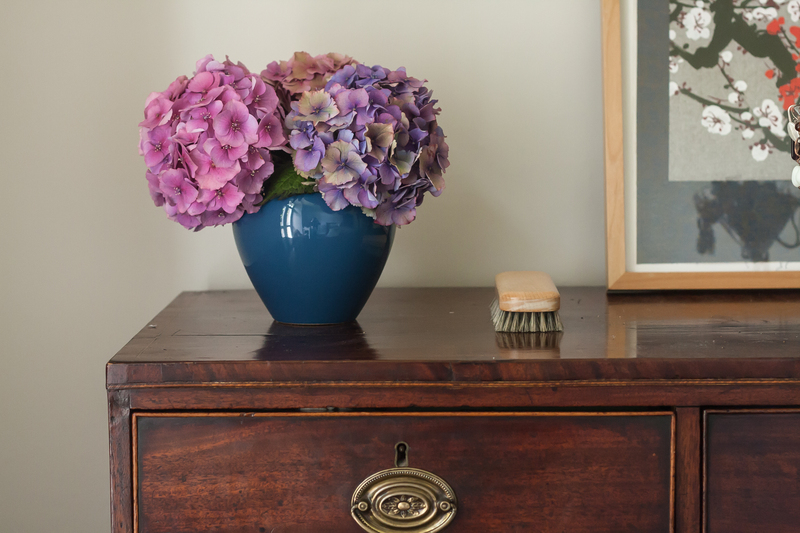 So I fell upon this ‘last chance rail’ and rescued an armful of hydrangea heads. Here some of them are, decorating a chest of drawers. delicate – in contrast to the pig – love that pig! That’s a very appropriate comparison, the idea of a clothes rail – I know exactly what you mean. Surely you can’t be holding me responsible for your delphinium though?!! 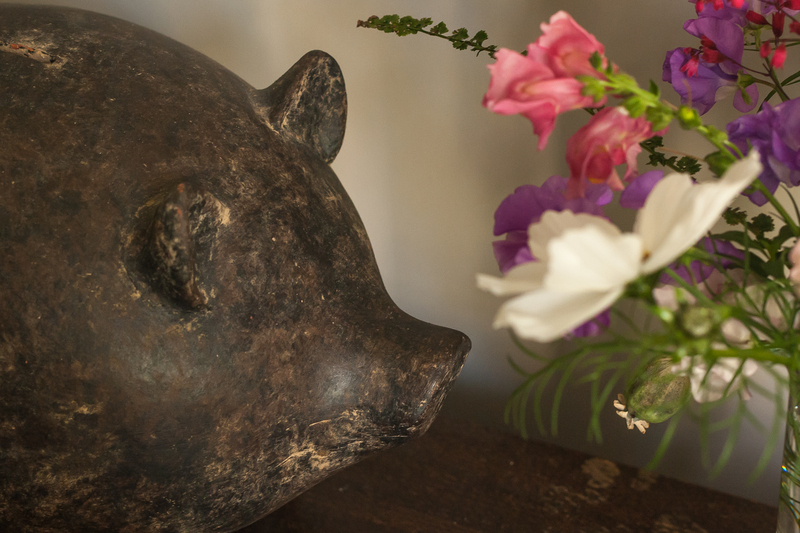 😉 It does like very fine though, with all the other oddments on your clothes rail of a vase, and of course Mr Pig is an excellent custodian. 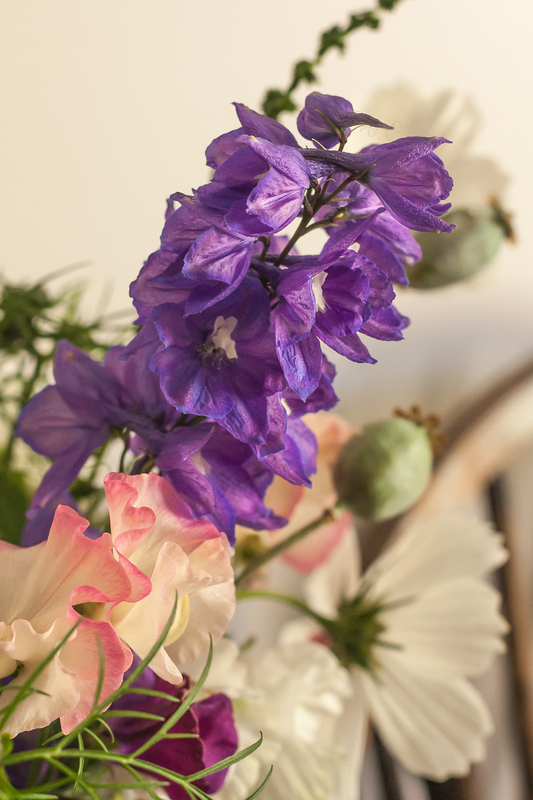 Thanks for sharing – and for your delphinium! Anything for you Cathy! I still have two delph spikes left to look at outside my window..
Love the flowers, but ADORE the pig. Was he local? Alas, Mr Pig has been a member or my household for the best part of a decade. He did come from Edinburgh, long before I lived here, in the days when I used to visit my sister here. The shop in Stockbridge may well still be there, though I doubt Mr Pigs brothers remain. I never need an excuse to wander along Raeburn Place though… I’ll take a look next weekend and report back if I have a moment. I agree the stock is dwindling mostly because of the weather and changes coming in the weather…you have rescued some lovely blooms. Yes – we are already dropping down to 7 degrees at night, or even less perhaps. I think the cosmos will stomp on regardless for a while, but the sweetpeas are definitely on their last legs. Love the idea of the clothes rail! The wind is so strong today I hope I’m going to be able to pick some flowers and they won’t be petal-less! The hydrangeas are lovely, well saved.